"The transformation of lower Manhattan has been an enormous team effort– with the city, state and federal governments working together, investing together, and forming partnerships with the private sector." Among Battery Park City Authority’s most valued partnerships is with its active seniors group. Coordinated by a team of dedicated local volunteers, Battery Park City Seniors is led by a Steering Committee and assisted by others who lend their time and talents to organizing specific events. 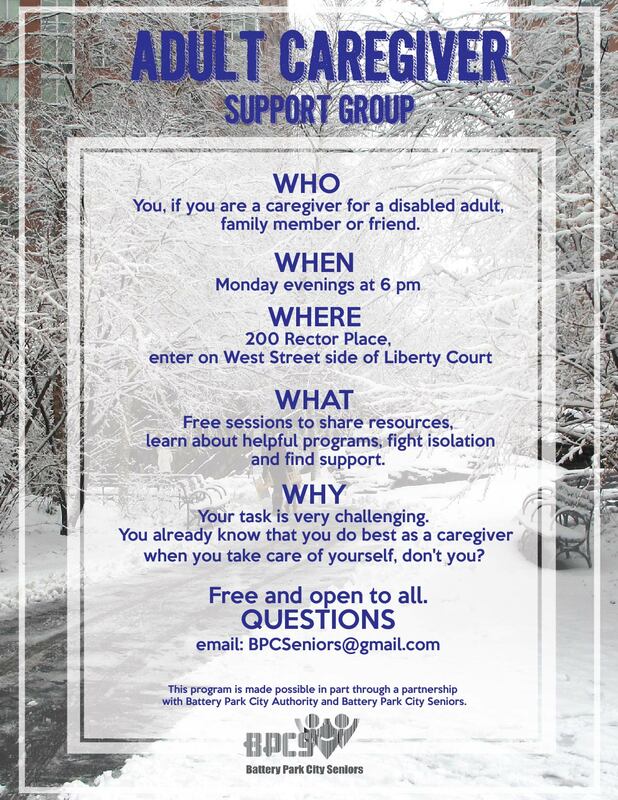 Most recent among these is the Adult Caregiver Support Group, which will be holding its first-ever meeting on Monday, January 28, 2019, 6:00pm at Battery Park City’s new Community Room in 200 Rector Place (please enter on the West Street side of the Liberty Court building). Being a caregiver for a disabled adult family member or friend is very demanding, whether you care for someone with physical or cognitive limitations, or both. At these sessions, the group will share resources and ideas, learn about helpful programs and fight isolation, which so often results from caregiving responsibilities. Attending these sessions is free and open to any caregiver who lives or works convenient to the greater BPC area. The group will evolve to meet the needs of those who attend, so please come to share and learn. More about Battery Park City Seniors can be found here. Sign up for BPC Seniors updates here.